Strong and durable single-patient-use carbides feature a blended neck design that minimizes breakage and offers sharp, consistent cutting. For some dental products, the magic is in the design. And any design that can eliminate a product’s weakest link is a win for clinicians. That’s certainly the case for Microcopy’s NeoBurr carbide burs. When it comes to dental burs, which aid clinicians in some of the most rigorous procedures, the neck is a prime place for weak points that can lead to bur breakage. 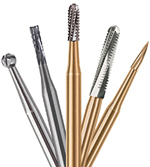 But NeoBurr carbides feature a new blended neck design for enhanced durability and strength, effectively eliminating the weakest point on the bur and offering clinicians a break-resistant carbide for even the most demanding of procedures.